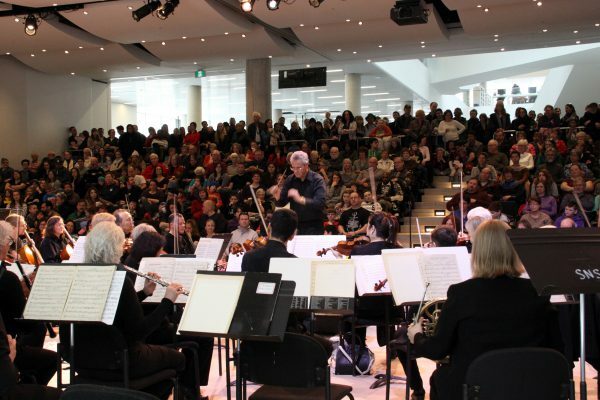 Halifax, NS – Symphony Nova Scotia presents a series of free concerts and special events during its ninth annual Symphony Week, followed by the nationwide arts celebration Culture Days. This year’s Symphony Week runs from Monday, September 19 to Sunday, September 25, with Culture Days happening from Friday, September 30 to Sunday, October 2. The festivities will feature Symphony Nova Scotia musicians giving free, live performances at venues like the Alderney Landing Theatre, the Truro Public Library, and the Halifax Central Library’s O’Regan Hall. Performances will include everything from children’s music to orchestral concerts featuring the entire Symphony. This will be Symphony Nova Scotia’s seventh year participating in Culture Days, an interactive, free-of-charge festival celebrating arts and culture from coast to coast to coast. For the full Culture Days schedule, visit www.culturedays.ca. “We’re delighted to be opening our 2016/17 season with Symphony Week and Culture Days,” says Symphony Nova Scotia CEO Chris Wilkinson. Introduce your preschooler to music in a fun and comfortable environment! 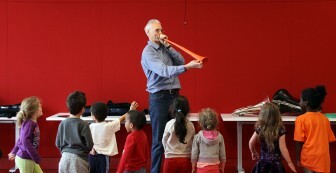 Two Symphony musicians show off their instruments, while children dance, conduct, and express the sounds through motion. THE LIBRARY PLAYERS GO FOR BAROQUE! Bring your lunch and join Symphony Nova Scotia musicians Max Kasper, Yi Lee, and Anita Gao Lee for an informative and fun look at music from the Baroque period. Hear music from composers like Corelli, Bach, Handel, Telemann, and Pachelbel, along with entertaining, behind-the-scenes stories about the composer’s lives. Hear Symphony Nova Scotia live at the VIA Rail Train Station in Halifax! The orchestra performs highlights from its upcoming concert season, including excerpts from Beethoven’s Seventh Symphony, Tchaikovsky’s Swan Lake, and The Nutcracker. Plus, hear Barber’s moving Adagio for Strings and music from the Beatles! After once again presenting its newest concert series at Alderney Landing Theatre last season, Symphony Nova Scotia returns to Dartmouth to perform highlights from the upcoming concert season. Hear highlights from Beethoven’s Seventh Symphony, Tchaikovsky’s Swan Lake, Barber’s Adagio for Strings, and the Beatles in this free concert for all ages. Come on out and hear Symphony Nova Scotia performing live at the Halifax Central Library’s O’Regan Hall! Hear music from the orchestra’s upcoming concert season, including excerpts from Beethoven’s Seventh Symphony, Tchaikovsky’s Swan Lake, and The Nutcracker, plus Barber’s moving Adagio for Strings and music from the Beatles. This concert is a great way to experience a live orchestra for the first time, and all ages are welcome. Come early to get a seat! * Please note that the concerts at the VIA Rail Train Station, the Alderney Landing, and the Halifax Central Library will all feature the same program. Symphony Nova Scotia violinist Yi Lee and his daughter, pianist Lala Lee, perform for IWK patients, families, staff, and members of the public in the IWK Atrium. Join the Gatto Dolce duo in Truro as they explore the funny side of composers who best exemplified the seven deadly sins: Pride, Greed, Lust, Envy, Gluttony, Sloth, and Wrath. Featuring music from Beethoven, Dragonetti, Sibelius, Rossini, and more. 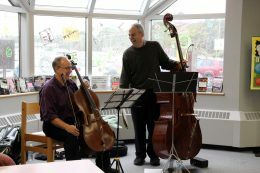 The Gatto Dolce Duo is Colin Matthews, cello and Max Kasper, bass. Learn about music, orchestras, composers, and more with “Symphony 101”! This relaxed, accessible class features instruction from music lecturer Adrian Hoffman, a Dalhousie University instructor and former CBC Radio host. We’ll also hear from Symphony Nova Scotia timpanist Michael Baker, who will give a personal perspective on his instrument and his role as a professional musician. Symphony Nova Scotia’s Symphony Week also includes a free performance for residents at Shannex at the Gardens, as well as a performance at the NSLC’s Festival of Wines Gala, a gourmet multi-course feast featuring award-winning wine and music. For tickets or more details about the Festival of Wines Gala, click here. All public events during Symphony Week and Culture Days are free to attend. For more information about Symphony Week, call 902.421.1300 or visit www.symphonynovascotia.ca.